Tracking Twitter mentions is one of the most effective ways to measure your brand’s presence on the network, as mentions of your brand indicate inclusion in conversations. Research from Maritz and Evolve24 found that 83% of customers who made a complaint about a business on Twitter appreciated when a company responded. Unfortunately, that same study showed only 29% of companies actually replied to customer complaints on Twitter. Clearly, there’s a mismatch between how customers and businesses are using the social media platform. “Doing well” on Twitter means a lot of different things to a lot of different people, but most social media marketers agree that it has to do with engaging with fans. The act of doing so could result in a larger audience—in addition to more loyal and happy customers. With regards to Twitter mentions, here’s how to find, track, and get more. Want to ask Sprout and Twitter your own questions? Sign up for this upcoming webinar with experts from Twitter and Sprout Social as they discuss Social Customer Care in 2018! 1. @Username: When people use the term “Twitter mention,” this is usually what they’re referring to. A mention is when someone uses the @ sign immediately followed by your Twitter Handle. 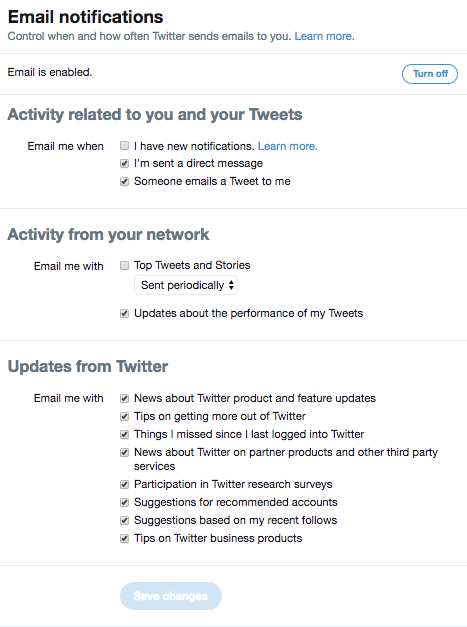 Depending on your settings, you’ll receive a notification from Twitter that someone has mentioned you. 2. Brand mention: This is when someone mentions your company or brand name in a Tweet without the @username. It’s common when people Tweet a link to a blog post from your site or if customers are commenting about your company. With a brand mention, you won’t receive a notification because Twitter views it as just text. 3. Hashtag: Another common way that people mention brands on Twitter is with a hashtag, especially if your brand is well known. Again, you won’t get a Twitter notification if someone mentions your brand name in a hashtag. Sometimes people will use different hashtags that contain your company’s name, which can make tracking brand mentions a little bit trickier. Replies vs. Mentions: What’s the Difference? A reply is a response to someone else’s Tweet. Previously, it started with an @username and subsequent Tweets were connected as a thread below the first one. Now, Twitter has changed the way that replies work. While the user still gets notified about replies, Tweets no longer contain the @username. Twitter made it this way so that more of the 140 character limit would be available for the actual message of the Tweet. Another important thing to know about replies is the fact that they’re only seen by the sender, the receiver and people that follow both parties. Mentions are more of a public conversation and can contain the @username anywhere in the Tweet. Whether you like it or not, consumers use Twitter as a customer service tool. 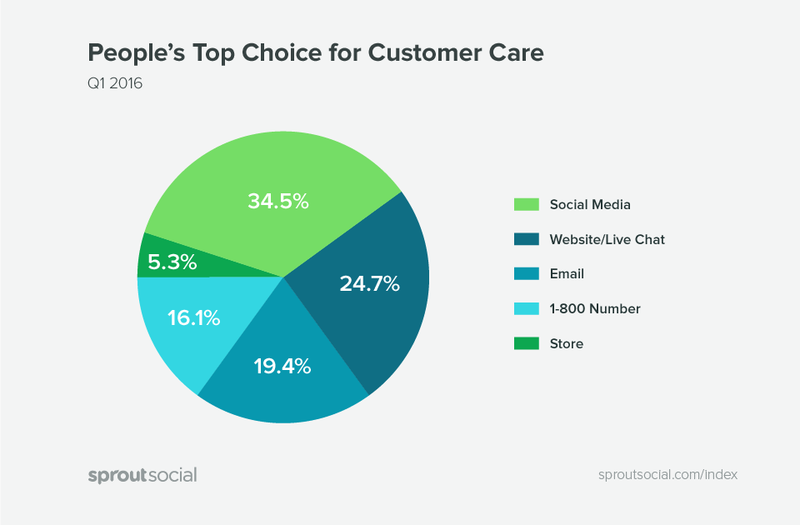 In fact, social media is consumers’ top choice for customer care. Oftentimes, this exchange comes as the result of a customer having an issue, which means that back and forth communications between your brand and your customers may be a little terse on this medium. In fact, some brands only use their Twitter accounts to respond to complaints, crises and issues. But Twitter is more than that: it can build human connections, which is an important marketing activity for a brand on any medium. Perhaps because of this, most companies take for granted how Twitter can be used as a tool to make customers feel special. A like, or even better, a reply, can make people happy because these activities provide a sort of affirmation in the digital age. When a celebrity Tweets, they get a large volume of replies. But for those that get answers, their day is made. A Twitter account is one of the most direct links people have to other people and organizations—don’t underestimate the power of your company’s. Now that you know why it’s important to take note of Twitter mentions and replies, here are a few different ways to track them. First, make sure that your Twitter account is setup to receive notifications whenever you’re mentioned. You can receive notifications from the web, email or on your phone if you install the Twitter app. Simply log into your account and go to the notification settings to enable this feature. With your notifications setup, now it’s time to find mentions. Let’s take a look at how to find mentions within Twitter. Start by searching for “Company Name” on Twitter. You’ll see all of the public Tweets that contain your company name. Click on the Latest tab if you want to see the most recent Tweets. Using Twitter search will give you a basic overview of who’s Tweeting about your company. You’ll get a mix of Twitter mentions as well as Tweets that contain your company name sans @username. For more accurate results, use Twitter’s Advanced Search, which allows you to create special searches based on certain terms, people, dates and places. Twitter allows you to save up to 25 searches, which makes information retrieval much easier, especially for niche brand mention searches. Unfortunately, a manual approach is hardly sufficient for long-term monitoring, especially for a large brand with frequent Twitter mentions. 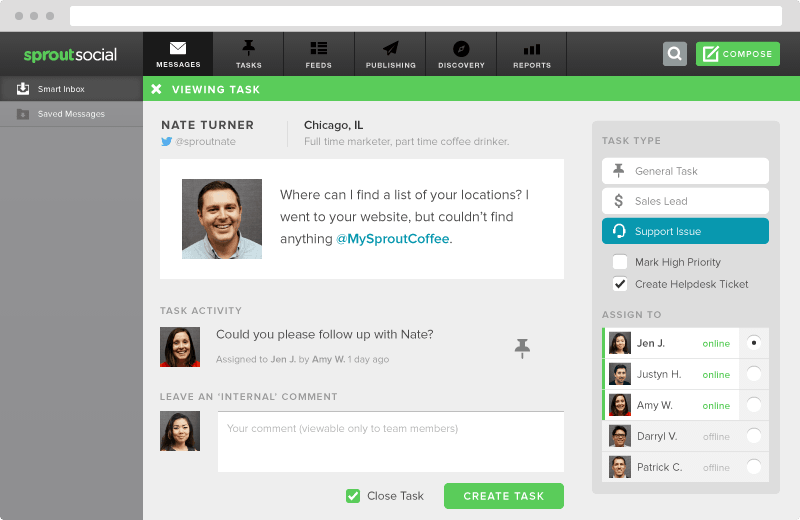 So a better way to track mentions is through a software program, like Sprout Social’s Twitter management tools. 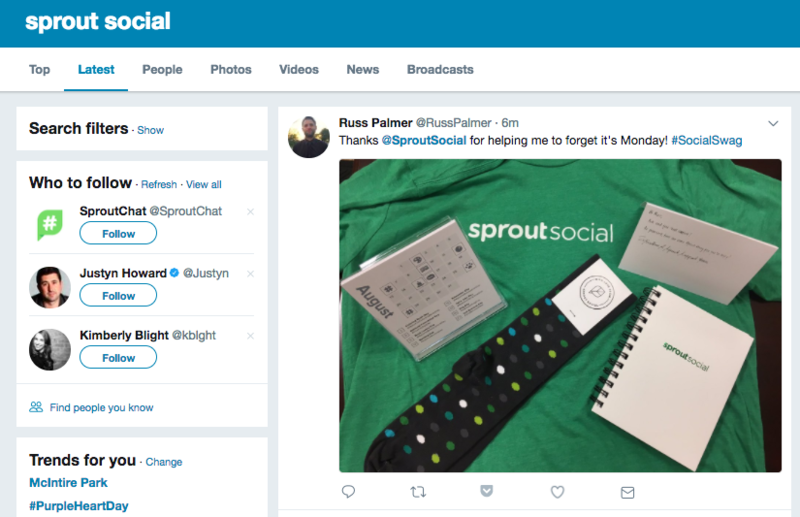 Sprout Social’s Twitter management tools provide a complete solution for your business’s Twitter needs. Not only can you see real time Twitter mentions, but you can also save specific searches and easily follow a conversation with users that mention you. Once you’ve completed this step, your dashboard will show you all of the latest Tweets containing those specific searches, instead of running three separate searches. This helps to ensure that you don’t miss any mentions of your brand name on Twitter. Having all of this information in one place also makes it easier to respond. 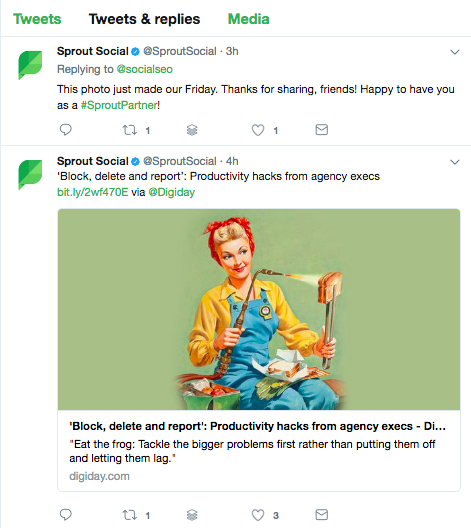 Sprout Social’s Twitter monitoring features also make it easier to communicate with both team members and customers. For instance, when someone mentions your brand with a technical support issue, your social team can assign that Tweet as a task for your customer support reps to follow up with. There is also a VIP list feature where you can tag influencers so that you can make sure to reply to them first. Also, you’ll have a history of all the conversations you’ve had with users that mention you, be it DMs, replies or Twitter mentions to provide informed customer care. You can also set-up keyword searches to discover and monitor engagement opportunities. In the perfect world, customers and fans would @mention you whenever they share your content or mention your company on Twitter. Getting an @mention in Tweets makes your account more visible, which can help you to earn new followers. Of course, the world is rarely perfect. Some users will inevitably just type your brand name without including your Twitter handle in the Tweet. Add social sharing buttons to your website, which allows you to share content to Facebook, Twitter, LinkedIn, Pinterest and other social networks that you specify. If you set these buttons up correctly, when someone shares your post on Twitter, text mentioning your company’s @username (ex/ “via @username”) is added to the end of the Tweet. This simple tactic makes it easier to keep track of who’s sharing what content from your website. Check out this article to learn more about integrating social media buttons on your website. Hashtags are used to track content on social media sites, notably Twitter. Hashtags allow people of similar interests to find content from like-minded individuals. They also serve as conversation starters. If you’re not sure which hashtags to use, check out this guide to the most popular hashtags on Twitter. Instead of waiting for someone to start conversations with you, start them yourself! Once you send a Tweet mentioning another user, they’re likely going to reply and @mention you. The conversations will show up in the other person’s stream under Tweets and Replies, which could get noticed by other people browsing their account. Engage with authorities and influencers in your industry and this technique can earn you a lot of recognition—it’s the power of association. Similar to starting conversations, engage with other people’s Tweets by liking or replying to their Tweets. Enact the principle of reciprocity by retweeting the content of an industry influencer, or someone else you value connecting with. People take note of others that retweet their Tweets and may return the favor to you one day. Retweeting is an act of endorsement, which can be very powerful coming from an influencer with an engaged audience made up of people similar to your target market. Ideally, you’ve snagged your company’s exact name as its Twitter Handle. If not, you run the risk of people @mentioning the wrong Twitter Handle, or just giving up and not mentioning your brand at all. That said, if the Twitter Handle for your company name isn’t available, don’t panic. Just choose something as close as possible, avoid using underscores and keep it short and simple. 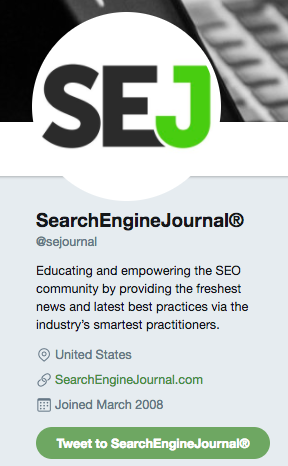 For instance, Search Engine Journal’s name is too long to be made into a Twitter Handle. So instead, the company abbreviated the handle to @SEJournal. One way to make customers happy and to keep getting Twitter mentions is to send timely replies to customers. 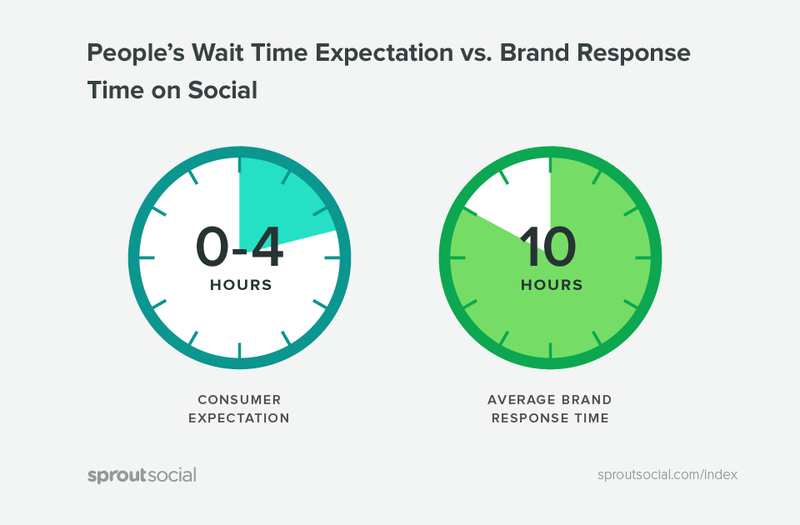 According to data collected in our Sprout Index survey, customers expect a response from your brand within four hours. Unfortunately, the average response time for brands is 10 hours. Being slow to respond, or ignoring customers completely not only hurts your brand’s reputation, but it also costs you money. 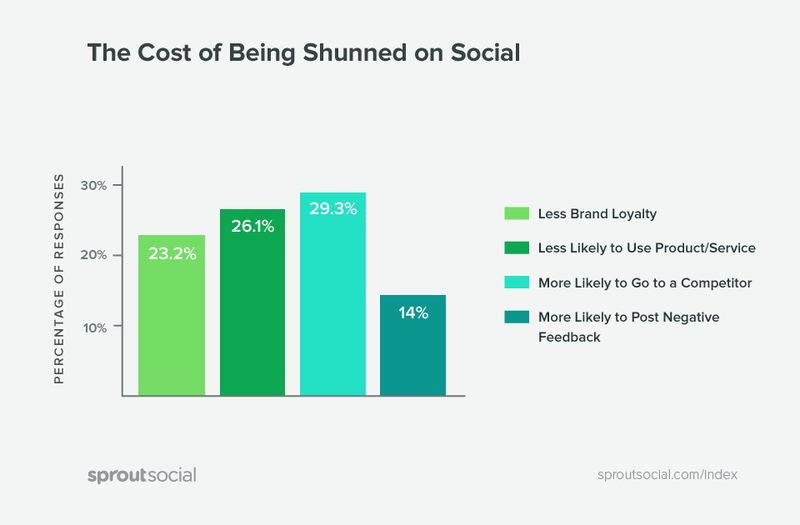 In act, 29% of consumers are more likely to go to a competitor after being shunned by brands on social media. Decrease the likelihood of losing customers by actively monitoring your Twitter mentions and responding promptly. Again, this is when a Twitter management tool really comes in handy. Particularly for brands that receive a high volume of incoming messages. Whether online or in real life, people are attracted to authority figures. If people think your content is awesome and authoritative, you will get mentions from people asking for help or complimenting you. One of the best ways to increase your brand’s authority is through creating and sharing industry related content. Whether through a blog, YouTube or directly on social media, use content to showcase your expertise and position your brand as the authority in your industry. This is the exact strategy SEO software company Moz used to grow its audience and grow awareness on Twitter. The company created resourceful articles on their blog, as well as weekly educational videos to showcase their knowledge of SEO. As a result, people constantly share their content and @mention them in Tweets. Tracking your mentions might seem simple enough, but it’s usually the easiest tasks that are the most likely to get messed up. Here are some of the most common mistakes you should avoid when tracking Twitter mentions. Not tracking misspellings: Spell check doesn’t work for Twitter Handles. If someone tries to @mention your Twitter Handle, but misspells it, Twitter doesn’t correct it. Therefore, it’s a good idea to track mentions of common misspellings of your company name on Twitter as well. If your business name contains any of these words, you should do a quick search on Twitter to see if people have been trying to @mention you with a typo. Only tracking @mentions: As we mentioned earlier, not everyone is going to use your Twitter Handle when they mention your company. Track Tweets containing your brand name and hashtags too. Tracking Twitter mentions sporadically: Twitter moves in real time. When customers mention your brand name on Twitter, you can’t afford to wait a couple of days to reply. Check your mentions throughout the day so that your followers and customers don’t feel ignored. Take control of the conversation and stop missing out on opportunities to interact with your audience by understanding the importance of finding and tracking Twitter mentions. 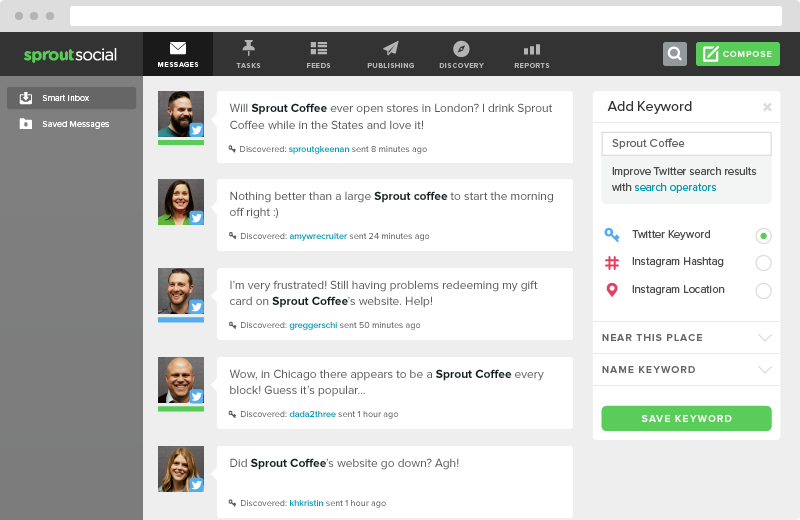 Use Sprout’s Twitter management tools to make sure that you never miss an opportunity to engage with your fans. Do you have any tips for managing Twitter mentions? 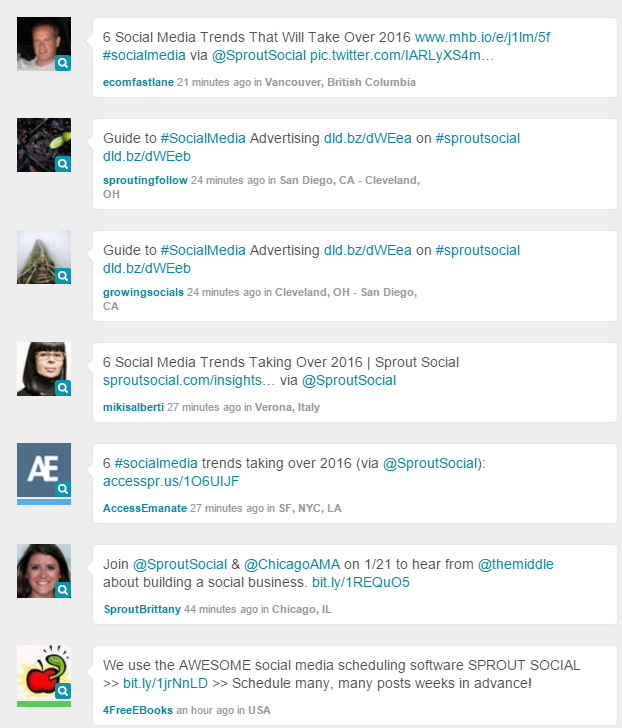 Tweet us @SproutSocial, and we’ll share the best insights!